It's pretty clear why you would consider Point Lookout, Maryland, a strategic place. Here, the Chesapeake Bay and the Potomac River meet. Now it's a state park, with a campground, fishing, kayak rentals, great views, and deer flies. Captain John Smith landed in 1608, and the British raided during the Revolutionary War and the War of 1812. In the 1850s, a private resort operated on the site. During the Civil War, the U.S. government soon eyed the land for its own uses. 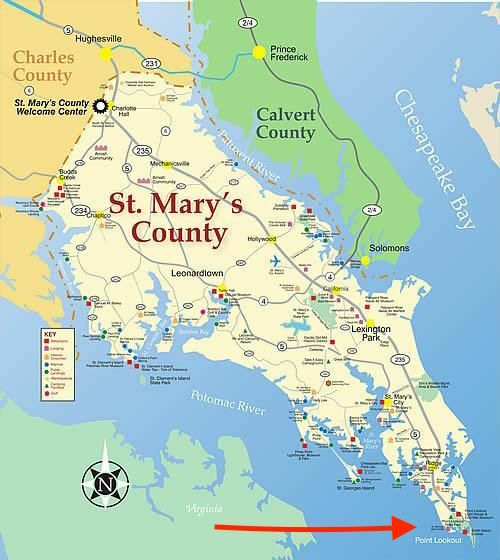 Maryland did not secede, although this part of the state was decidedly pro-Confederate. Nonetheless, the Union used the point for a hospital, fort, and, after Gettysburg in July 1863, prisoner-of-war camp. In the winter, a high tide and an easterly gale would flood the whole surface of the pen and it froze as it flooded. As regards medicine and clothing, they are sadly in want of both and would suggest the commission send some....I know they are our enemies, and bitter ones, and what we give them they will use against us, but right now they are within our power and are suffering. Ten thousand prisoners--double that by 1865--were crowded into 40 acres. They slept in overcrowded tents, surrounded by fourteen-feet walls. U.S. Colored Troops regiments rotated in and out to serve as prison guards. It's easy to imagine this as a deliberate taunt to the Confederate prisoners. Some prisoners' writings depict cruel treatment by the guards--whether they were particularly harsh, whether harshness comes with the job description, or whether race entered into this perception probably varied by individual guard and prisoner. The Union also built a hospital that began with the resort building from the 1850s. It grew to a series of buildings in a circle like a wheel, as shown here. (The POW camp is up to the right). Point Lookout, with hospital in the foreground and POW camp in the Upper right. Library of Congress image. The embankments around Fort Lincoln still exist. A guard house and barracks for officers and enlisted men were re-created. Entering Fort Lincoln, with re-constructed barracks in the background. During the Civil War, three cemeteries were built, two for the prisoners and one for the Union dead from the hospital. After the war the Union dead were moved to Arlington, The Confederate dead were moved outside the park in 1870, and in a mass grave. (It is claimed that many more died and remain unaccounted.) Confederate flags are displayed--a rather jarring sight on the way to the park and next to a government cemetery, but the parcel of land with the flags is owned privately.